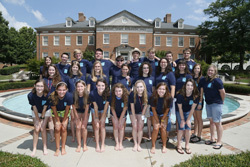 The University Fellows honors program at Samford University hosted 22 high school students at its third annual Great Ideas Summer Institute June 16-22. Students in this year’s challenging weeklong program explored the theme of “Greece, Rome, and the American Republic”. Full-time Samford faculty led three discussion-based class sessions each day, ranging from the ancient writings of Pericles, Plato, Aristotle, Livy, Plutarch and Cicero, through key works of Montesquieu, Jefferson, Hamilton, Calhoun, Lincoln and Marshall. Most of the students were reading and relating classical texts and foundational American documents for the first time. GISI organizers complemented the class sessions with a variety of community activities, including visits to Birmingham Civil Rights Institute, the historic Alabama Theater, Birmingham Museum of Art, Railroad Park and Birmingham Botanical Gardens. Screenings of the films Lincoln and Dr. Strangelove provided both entertainment and fodder for classroom discussions. The students were especially taken with GISI’s discussion format, which not only required them to read and think critically, but also to actively engage with faculty and other students. That emphasis on their own understandings and responsibilities in a learning community was an exhilarating new experience for many. “I just love the learning style,” said Hannah Johnston of Traveler’s Rest, S.C. “We can sit and talk and bounce ideas around and get a feel for other people’s opinions”. She added that GISI set a high bar for those views. “The professors really challenged us to question what our opinions are, why we believe what we believe, why we think what we think,” Johnston said. Cameron Teaney of Greenville, S.C. and C.G. Kendrick, currently of Stuttgart, Germany, also were impressed with how that standard created informed and civil disagreement at GISI. “We’re able to have logical, intelligent discussions without getting angry and frustrated,” Teaney said. That spirit flowed into informal discussions, too, so that Kendrick’s lunchtime conversation about religion reflected the students’ overall GISI experience. “It was a really nice discussion I didn’t expect to have…ever".